The Flag Shop is proud to work with organizations supporting vital programs which improve the quality of life for individuals. 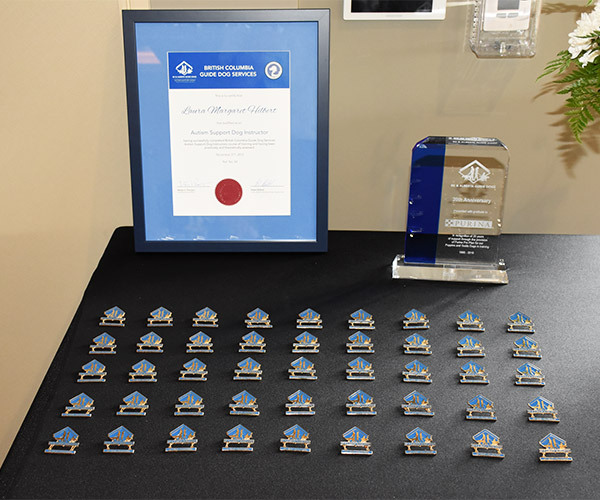 One such example is the supply of special custom lapel pins, vinyl stickers and retractable banners for events and projects of BC & Alberta Guide Dogs. The mission of BC & Alberta Guide Dogs is to meet the growing demand for professionally trained Guide Dogs and Autism Support Dogs for citizens of British Columbia and Alberta, while meeting or exceeding industry standards. BC & Alberta Guide Dogs, is celebrating 20 amazing years of making a difference in the lives of individuals with visual impairments and autism. This past summer, BC & Alberta Guide Dogs held its 20th Anniversary Volunteer Celebration Luncheon at Tsawwassen Springs in Delta, BC. At the event, volunteers were recognized, including over 130 supporters who contributed at least 5 years of service, all the way up to 20 years! 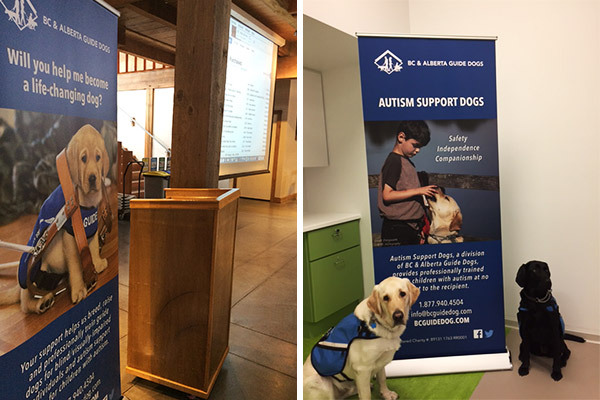 And earlier this month, BC & Alberta Guide Dogs celebrated with the Pacific Autism Family Network in Richmond, BC, who held its Grand Opening event. For additional Information about upcoming events in BC and Alberta, visit the events page. Quality of life has been immeasurably transformed for countless individuals, such as Sarah and her family. Sarah was diagnosed with autism at the age of two years. She didn’t like going out in public. The sounds and people were simply too overwhelming for her. Her behaviors made getting through the day a difficult struggle. Everything changed when Sarah met her best friend, protector, companion, therapist, and brother. From the minute Brady walked into our home, he changed our lives forever! Watching the two of them together was amazing! Of Brady, she said, “I’ll never be lonely again as long as I have my trusted furry friend!” To say thank you to all of the people responsible for bringing Brady into our lives seems so inadequate. BC & Alberta Guide Dogs has given us a gift that has brought such joy and happiness! Brady has changed our family forever. Our daughter is happy and safe. The quality of her life has improved beyond anything we could have ever hoped for. We are so very grateful! 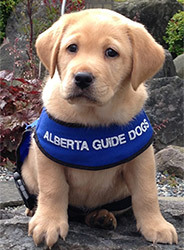 Visit the BC & Alberta Guide Dogs website to read more stories of impact or to learn about volunteering opportunities. On November 11, we remember the men and women who fought to preserve the tradition of freedom which Canadians enjoy every day. These heroes believed their actions would leave a lasting legacy of freedom for future generations. We must all do our part to ensure their dream of peace is realized. On Remembrance Day, we honour them for their ultimate sacrifice and pay homage to the courage of those who served their country in the name of peace for all nations. The Flag Shop Montreal proudly supports Operation Veteran supplying hundreds of flags in support of this important program, since 2009. Operation Veteran was founded By Dr. Paul Kavanagh in partnership with the Canadian War Museum with the goal of providing complimentary meal vouchers to all Canadian military veterans who visit the museum. The work of Operation Veteran pays tribute to the men and women who have served our nation, and helps us to remember our fallen heroes who sacrificed their lives to ensure freedom for future generations. All veterans visiting the museum are offered a meal voucher valued at $11 in honour of Remembrance Day. Since the first voucher was offered in 2009, more than 10,200 veterans have enjoyed a complimentary meal while visiting the museum. 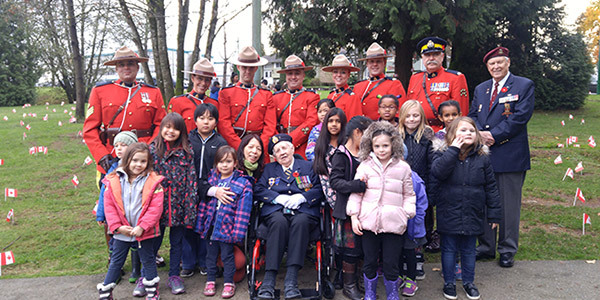 The Flag Shop Vancouver acknowledges the work of the George Derby Centre, of Burnaby BC. This intermediate care facility provides residential care to veterans of the Armed Forces. The centre was built over 50 years ago, originally as a rehabilitation centre for young disabled veterans returning from the war. Today, the centre provides essential residential care to war veterans in its 300-bed facility. The George Derby Centre relies on community support in the form of volunteerism and important funding efforts, such as the Pledge a Flag campaign. The goal of this event is to heighten public awareness of the importance of meeting the social and medical needs of our war heroes. All community support positively impacts the quality of life for veteran residents. 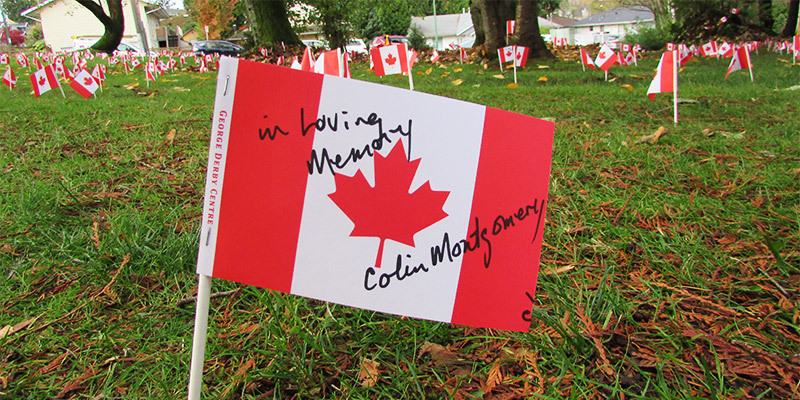 Thousands of Canada flags, – symbols of Canadian patriotism and pride – are pledged, and include visits by community school students from Cariboo Secondary School and Armstrong Elementary School. Interested in knowing more about other Remembrance Day events in your area? Learn more by visiting the Veterans Affairs Canada website, which includes an interactive map of Remembrance Day events across Canada. The Flag Shop proudly carries a full range of Canadian-made Remembrance Day products to honour veterans and pay tribute to our fallen heroes, as well as ensigns and military flags. You are currently browsing the The Flag Shop Blog blog archives for November, 2016.